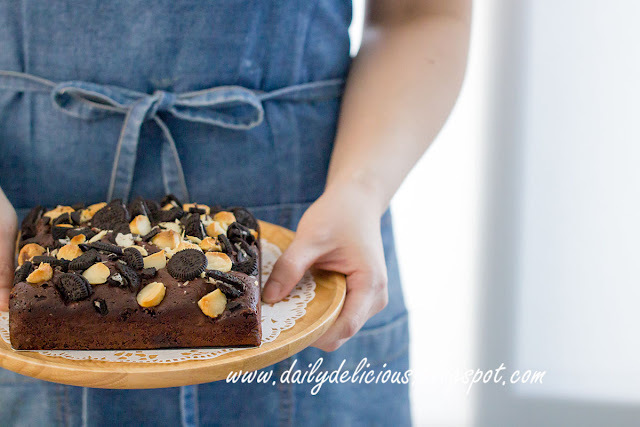 Making brownie is something easy and fun, as there are tons of recipe that you can try (or you can make different variations from just one recipe). There are 2 kinds of brownies that we usually make, cake and fudge. The different is the texture that come from first the ratio of the butter, chocolate and flour, and second baking time. Anyway, I love both of them ^^. 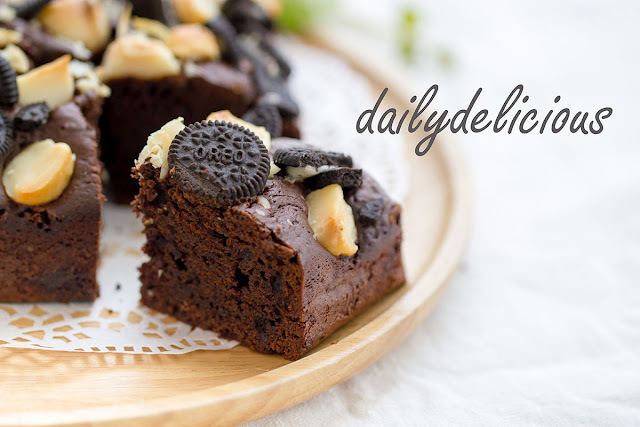 Today the recipe that I want to share with you is cake brownie, (if you like the fudge one see this recipe: Fudge Brownies ) It's very easy to make too. 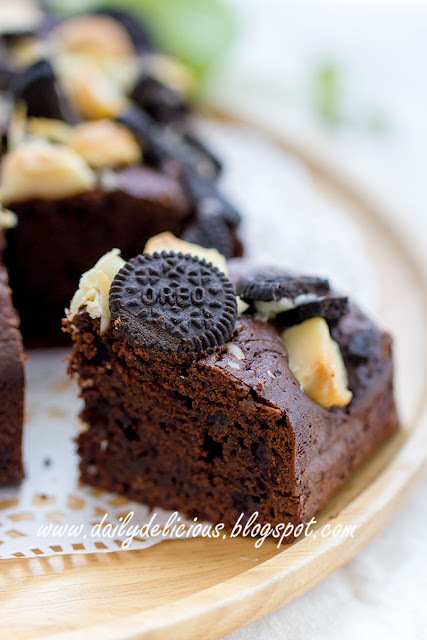 Just mix everything into one bowl and you get delicious and very cute brownies, hehe. 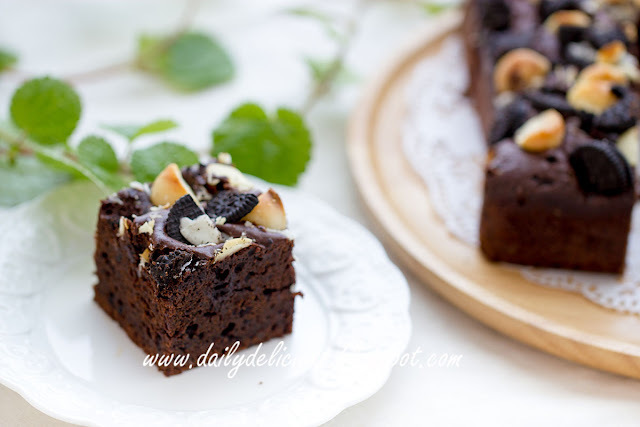 You can change the topping if you want, other kinds of nut or other kinds of biscuit (or chocolate candy) will do. I think it's the privilege of making your own dessert, you can make it the way you want ^^. *If use unsalted sugar, add a pinch of salt. Line 15x15 cm pan with baking paper. Put the chocolate and butter into a bowl and place over a pan of simmering water. Remove from the heat, pour the brown sugar sugar into a bowl, stir to combine. Put the whipping cream into the bowl, stir to combine. Pour the eggs into the bowl, mix to combine. Pour into the prepared pan. Level the top. 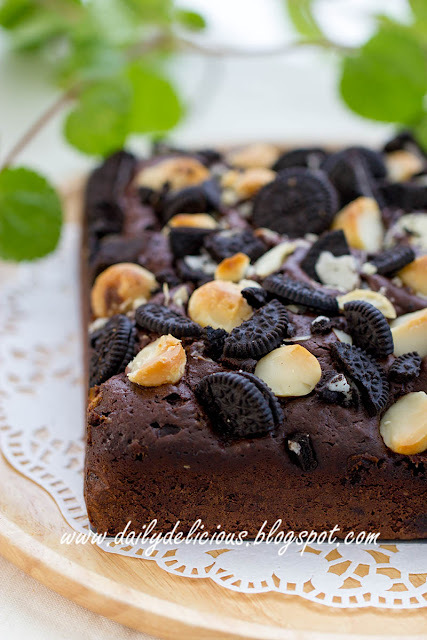 Sprinkle the macadamia nuts and Oreo on top.